Last Sunday my friend Tim had a car accident that scores extremely high marks for originality. He was overtaking a truck at 110 km/h when suddenly, WHAM, something big hit the windscreen. The glass cracked from top to bottom but didn't shatter. An owl. A tawny owl, Strix aluco! In Swedish it's kattuggla, "cat owl". The bird of course went straight to raptor Valhalla, but neither Tim nor his wife and son were hurt. Phew. 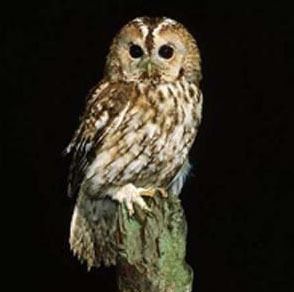 Female tawnies can weigh up to 800 grams. Still, Tim's got a good story to tell. That is original! A friend of mine totaled his car the other day hitting a deer, but that's pretty old hat, if a little more destructive. And I had a turkey clip the top corner of my car once. They're supposed to be so smart and all, but somehow they haven't taken in the concept of "car", and tend to fly or run out in front of you whenever they feel like it. A car is really just a hunting weapon for people without a gun license. How did you cook the turkey, and was it good? This one actually survived the encounter and flew off. Wild turkeys tend to be pretty tough (to eat, though I guess if this one survived a mano to mano with a car, it was tough in the other sense too), as they haven't been bred for stupidity and a great big giant breast. My accidental big game hunter friend was fine, if shaken. And he has to get a new car.